This transcript of yesterday's Q&A session is brought to you by The Hobbit. My fandom of J.R.R. Tolkien's books was created by my father. He read the entire series to me, tirelessly, and then when I begged he read it again. And again. And again. I honestly don't know how many times he read those books out loud. A lot, is probably the safest estimate. Of course, I've tried to carry on the tradition by reading The Hobbit to my children which is why, The Desolation of Smaug, was mandatory weekend viewing for us. It turns out that, despite having both read the book myself and heard it read many times, I'm still lacking in my Hobbit knowledge. Here's a list of the top popcorn breath questions whispered mid-movie. 1. 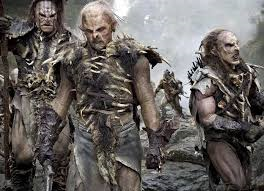 Where are all the girl Orcs? 2. And how do they reproduce so quickly? Is someone spawning them like in Minecraft? Me: I don't think so, but that's a good question. Shhh. 3. Where does the shapeshifter keep his clothes? Are they in the barn? Them: Where in the trees? Me: They don't show that part. Shhh. 4. In the dark forest: Why are they all acting so weird. Me: The air is sort of like a hallucinogenic. Me: The air makes them dizzy. Shhh! 5. When you're wearing the ring does it allow you to understand spider tongue? 6. Followed quickly by: Do you think if they met hamsters they would understand hamster tongue? 7. 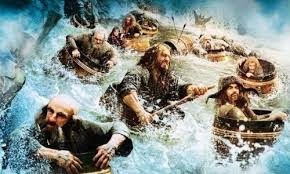 When the elves are going over the waterfalls in barrels: Why aren't the barrels filling up with water? Are they magic barrels? Me: Yes. They're filled with elven magic. 8. When Gandalf sees the Dark Lord. Why does it keep showing that figure going in on himself? Me: It's supposed to represent infinite evil. 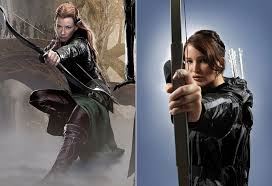 9. Who do you like better Katniss or Tauriel? Me: Can't compare. They're different species. 10: When can we see the next one? I absolutely silence my phone in the theater. But...I'm still working on my children. Until I get that figured out, you might want to sit a few rows away from us. Labels: The Hobbit. Desolation of Smaug. I left out all the dragon questions. Was too exhausted by answering them to revisit them. Movies. Kids. Life. I'll just go to s different showing! I did wonder about the barrels, but hey, elf magic works for me. My, they were full of questions, weren't they? Lol! That's cute. :) My daughter is constantly asking me questions during shows too, like what's going to happen next, and I tell her "I don't know! I'm seeing the same stuff you are!" Lol. Ah, so this is what having kids is like. Having answers to questions you never knew existed. I wouldn't even begin to know how to answer these. Well done. *giggles* Loved this question and answer. As to the no girl orcs, Tolkein was a notorious prude and afraid of all things girl, so if he could get away with leaving them out, he generally did. I'm glad they're bringing back Legolas, one of my faves. Haven't seen it yet, will soon. I love the fact that your father read those books to you. Lucky child, you were. Hope your holidays are great! I think you can be forgiven for not knowing all the answers, if #1 was anything to go by. A lot happened there that was never in the book so I expect more of the same in #2. 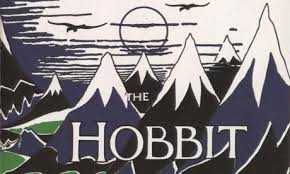 I read The Hobbit to my kids years ago, but only got part-way through LOTR before their attention wavered. We then decided they were old enough to watch the movies. You and the kids can sit right here by me! haha love your Q&A. Hubby and I will probably get to see Smaug after Christmas. LOL. It's cute that they enjoyed the movie so much. Love the Q&A. I think one of the most loving things a father can do is read to his children. My dad did sometimes, and I wish it'd happened more often. Glad you experienced that too. Blessings to you and yours, Johanna. Hahaha their questions were funny though! And thank you for silencing your phone during the movie; I wish more people were like that. So many people talk loudly on their phones during the whole movie or spend the whole time texting (the light from their cell phone screens bugs me). Pretty sharp kids...good thoughtful questions. Keeps you on your toes during the movies! !